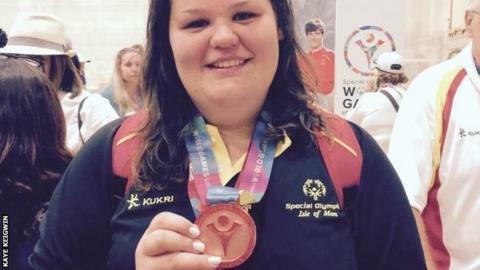 Teenage swimmer Emily Keigwin has won the Isle of Man's first medal at the Special Olympics World Summer Games in the United States. The 18-year-old set a personal-best time to claim a bronze medal in the 100m freestyle at the Uytengsu Aquatics Centre in Los Angeles. She told the BBC she was "thrilled" and "very proud." Meanwhile, the men's football team have recorded a 5-0 victory over Venezuela and beaten Italy 2-0. Elsewhere, Chris Hattersley finished fourth in the men's 25km road race, which took place in temperatures reaching 40 degrees. The Isle of Man has sent its to compete in the event, which runs until 2 August and features about 7,000 competitors from 165 countries. Manx athletes will take part in eights sports including football, swimming and bocce, a form or bowling, and cycling.